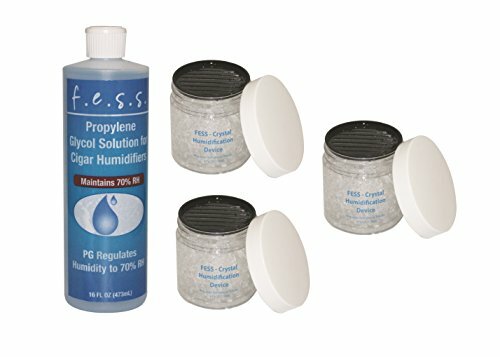 Fess PG Propylene Glycol Solution and 3 4oz Crystal Humidor Jar - A great humidor upgrade kit; One  bottle of fess 16oz PG solution and three  Fess 4oz crystal humidor jars, perfect to keep your precious puros in optimum smoking condition. fess two-way humidification system will keep your humidor at 70% relative humidity ensuring a "humidor fresh" smoke every time. You may fill your humidifier directly from this bottle. It's just that simple!